On 18 April 2014, a 14,000-tonne block of ice slid down the southern face of Mount Everest, killing 16 people. It was the mountain’s deadliest day, until just over a year later, when 22 died in the aftermath of the Nepalese earthquake. Thirteen of the men who died in 2014 were Sherpa, an indigenous ethnic group famed for their ability to withstand high altitudes. They had been finding their way through the Khumbu Icefall, one of Everest’s most dangerous passes. When the avalanche hit they were fixing a route so that tourists – some paying up to $75,000 to climb the world’s highest peak – could fulfill a dream. Not long before that, Jennifer Peedom had arrived to make a film about the Sherpas. She had been on three Everest expeditions; over the course of those visits, she had seen how the Sherpas’ role in getting tourists to the top had been played down, and she knew that there was a story to tell. But she couldn’t have known that she would be there as news of the disaster rolled in. She couldn’t have known that she would film as the Sherpas’ bodies were airlifted off the icefall, and watch as the locals channelled their shock and anger into something unheard of: a strike. Now, with her film, Sherpa, about to be released in cinemas, she acknowledges that it is not the film she intended to make – but argues that the story she emerged with is an essential one. “They are a people moving towards self-determination, which is a very natural thing,” says Peedom. 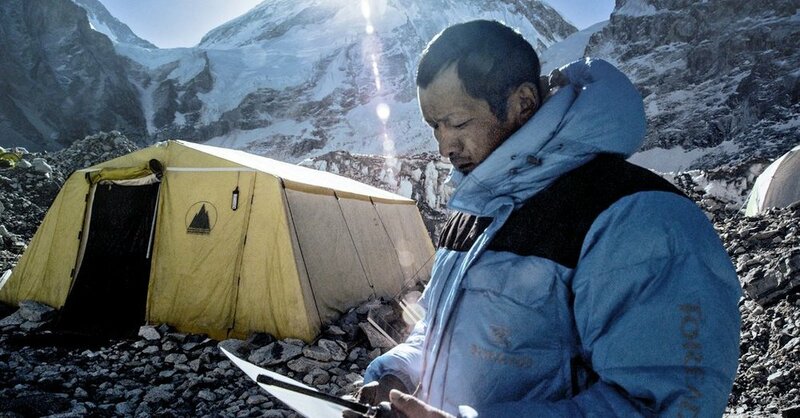 “Sherpas are becoming better educated and going overseas. They’re getting climbing credentials and coming back [to the western expedition leaders] and saying: ‘I’m as good as you.’ That puts pressure on the status quo”. The disaster prompted the Sherpas to demand better insurance, a rescue fund and eventually, the cancellation of the 2014 climbing season. Even before then, they were starting to chip away at the stereotypes that had plagued them since legendary climber Tenzing Norgay became one of the first people, along with Sir Edmund Hillary, to summit Everest in 1953. Norgay – genial, hard-working, always smiling – was portrayed by the press as Hillary’s loyal accomplice. The image of the happy assistant to the mountain-conquering Westerner stuck. Sherpa follows veteran guide Phurba Tashi, a Nepalese mountaineer with 21 ascents of Everest to his name, as he comes to the decision not to return to work in the wake of the tragedy. It was not an easy choice. His family didn’t want him to climb, but it is a lucrative job and he was loyal to his boss. Russell Brice is a celebrated New Zealand mountaineer and the owner-manager of the expedition company Himalayan Experience Ltd (Himex). In the film, Brice is feverishly trying to keep his business together, while facing a dilemma: how does he respect the Sherpas’ grief and keep them working to satisfy his clients? “The generous side of me would say perhaps he meant the expedition owners,” says Peedom. “But it did represent an attitude”. Everest is a valuable asset to the Nepalese government. Permits cost $11,000 per person. Before the 2014 disaster there was little incentive to be too stringent over who got to climb (Peedom’s film shows queues lining up to summit the mountain). Meanwhile, the wealthier thrill-seekers expect a luxury service. Brice’s company are shown waking clients at base camp with hot towels and warm tea. In the evening they sit around on fur-lined camp chairs drinking lager and watching TV. All of this is hauled up the slopes by the Sherpas. Then there are the camera crews. With an expensive climb comes sponsorship and the need to record the ascent and publicise the backers. Since April’s earthquake, the Nepalese government have limited access to permits to experienced climbers, hoping that will address concerns about safety and overcrowding. But the Sherpas still face an uphill battle when it comes to changing outsiders’ perception of them. The recent Hollywood blockbuster Everest, which was filming while Peedom was on the mountain, has angered the community. Based on the 1996 disaster in which eight climbers died, the Sherpas say the film downplays their importance. On returning from her shoot, Peedom had to re-pitch her film to her investors. They had been promised a documentary about a legendary Sherpa guide summiting Everest for a record-breaking 22ndtime. What she could deliver was what the Guardian’s initial review called “a workers’ rights film”.